Ringmaster K and Kiki are both well established solo street theatre and festival performers. Since 2014 they have performed their amazing duo act all across Canada. Don’t wait! 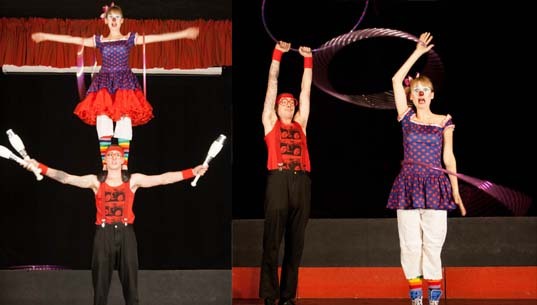 Book now to ensure Kiki the clown and the wacky Ringmaster K are part of your next event. They guarantee some hilariously interactive family fun. ~ Performed as a 30-45 minute show for street festivals and outdoor events. ~ Also performed as a 5 minute stage act. Perfect for gala events or wedding celebrations. ~ Roaming and ambient entertainment also available, including stilt walking and interactive juggling characters. Enhance any event and ensure guests are amazed! Looking to add something different to your event? We also offer coaching for kids and adults. We will teach a variety of skills within a safe and encouraging atmosphere for both indoor and outdoor festivals or events.